While we may still be stuck in the frigid winter, that doesn’t mean we don’t dream of the summer days ahead. In a few months, swimming at the lake, picnics, and grilling out with friends will be highlights once more. There are few downsides that come with the aforementioned leisure activities, and one such is cleaning the grill after it has been used. 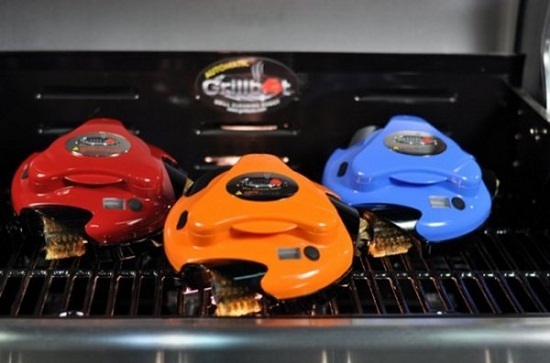 If you’d prefer to spend as much time as you can enjoying your summer rather than scrubbing away grime and grease with a steel brush, you could always get a Grillbot to do the grunt work for you. This is in essence a Roomba with some wire brushes on the bottom that will have your grill sparkling in no time. The Grillbot is a $70-$100 invention born from an idea of a wire brush being strapped to a drill. It has since matured, and has push button operation, three electric motors, replaceable brushes, a LCD alarm and timer, is rechargeable, and comes in four different colors. This will be available mid-June, so there’s plenty of time to save up if you’re interested.